Seismic amplitudes yield key information on lithology and fluid fill, enabling interpretation of reservoir quality and likelihood of hydrocarbon presence. The modern seismic interpreter must be able to deploy a range of sophisticated geophysical techniques, such as seismic inversion, AVO (amplitude variation with offset), and rock physics modelling, as well as integrating information from other geophysical techniques and well data. This accessible, authoritative book provides a complete framework for seismic amplitude interpretation and analysis in a practical manner that allows easy application - independent of any commercial software products. Deriving from the authors' extensive industry expertise and experience of delivering practical courses on the subject, it guides the interpreter through each step, introducing techniques with practical observations and helping to evaluate interpretation confidence. 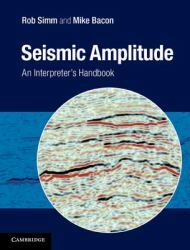 Seismic Amplitude is an invaluable day-to-day tool for graduate students and industry professionals in geology, geophysics, petrophysics, reservoir engineering, and all subsurface disciplines making regular use of seismic data.